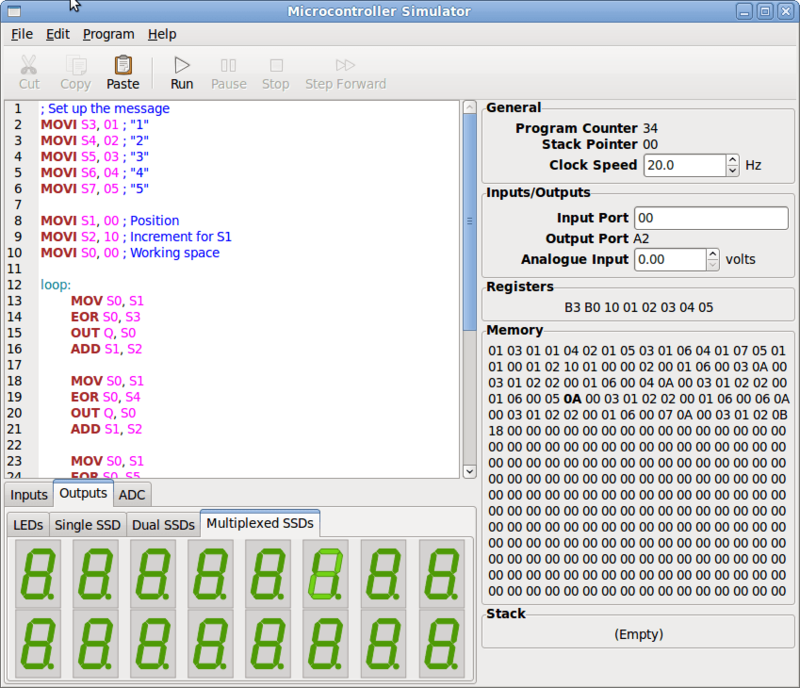 Here's an announcement I've wanted to make for a while: I'm releasing my microcontroller simulator, MCUS. It's a fairly simple simulator designed to aid in teaching the OCR 2008 A-level electronics syllabus to UK students. As far as I know, it's the only simulator available which follows the new syllabus (for which OCR have deigned to write their own simple assembly language, obsoleting any previous simulators used in schools). It's already had three releases (this is the fourth), but I didn't want to make the 0.1.x releases too public, as they were mainly for testing the program at school. The 0.2.0 release was a brown paper bag release, due to a bad GTK+ version dependency, and some files necessary for the Windows zip package not being included. It's available on the MCUS project page, with 0.2.1 being the latest release. A Windows installer is available too, built with NSIS; as well as a simple zip package of the installed directory tree on Windows, since the program's relocatable. My school is already using it, and I'm releasing it in the hope of other schools being able to make use of it. As always, it's open source, released under the GPLv3+. Future plans include a graph to visualise the ADC waveform, and the addition of more simulated input and output hardware. This entry was posted in Projects and tagged GTK+, MCUS, NSIS on November 10, 2008 by Philip Withnall. Screenshot looks good but the lit green is hard to see from the un-lit, if you know what I mean. That screenshot is from version 0.1.1. For version 0.2.0, the colours were changed so it's now light green on grey, which works better. It would be a good idea to list your software at http://www.gnomefile.org/ so it can be discover by other people. I do normally list my software on gnomefiles.org, but since MCUS isn't really useful to the vast majority of GNOME users, I didn't think it suitable. I am planning to submit an article to a UK electronics education magazine, though, which should go quite a way to helping people discover MCUS. The correct link is http://www.gnomefiles.org/ , sorry. Do you have any sample programs that might help getting started with this? Not at the moment, but I'll try and write some and put them up here in a future post. For the moment, you can look at the documentation for a reference to the assembly language, which will get you going if you already know some assembly. I suppose it would be a good idea if I included some examples in the package as well.